Me: "Hey Chris, want to come with me to a race? We can spend more time in traffic than we do sleeping, you can get up with me before the crack of dawn, wander around the finish line for 2 hours while I run, then take a picture of me when I limp in and watch me devour post-race pizza! What do you say?" I'm sure at least part of him really wanted to say, "WTF? You're nuts." He did come along to cheer me on, which was wonderful, and it really does mean a lot to know that you have a loved one or few waiting for you at the finish line. I was very grateful for that. I was also grateful that the race was on a Saturday morning instead of a Sunday. That meant we had time to do other things besides run (or wait on a runner). Chris has a couple of good friends in nearby Virginia Beach, and one of them happened to be hosting a cookout the night of the race. Chris got to catch up with some good friends, and I got to meet fun new people, drink water like it was going out of style, eat everything in sight, and hold my own in beer pong. The only downside to all of this springtime road trip fabulousness was the roads. Apparently, Virginia Beach area is allergic to left-hand turns. Everywhere we went (or tried to go), turning left was either impossible or illegal. Just going across the street to get a burger was a 15 minute ordeal. I highly disapprove of this transportation planning. Especially when it causes significant delays to stuffing a burger down my gullet when I'm superhero hungry. We still had one more day in front of us. So, beach, duh. We made the quick 30-minute trip to Virginia Beach proper on Sunday and had no left turn issues. Virginia Beach has a lot of things going for it. It has a 3-mile long boardwalk with occasional historical markers and monuments, huge swaths of sand, beach volleyball courts all over the place, and a commercial strip 1 block off the beach that is actually pretty quaint for a large beach town. It can get massively crowded in the summer months, but given that springtime has just begun, it was pretty dadgum perfect crowd-wise. 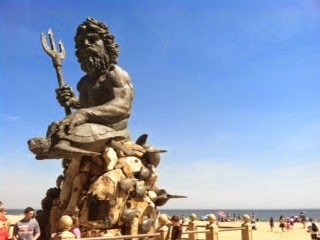 We hit the boardwalk where we were quickly greeted by King Neptune holding an angry-looking turtle. Next up was lunch, because I hadn't really stopped being hungry from the day before. 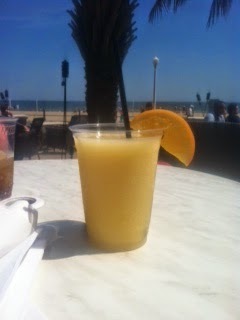 We stopped at Tortugas Cafe and Tiki Bar, where the food was meh, but the view and this mango daiquiri were pretty sweet. We continued our stroll down the boardwalk. There were people walking their dogs, running, and cruising past on strange bicycle contraptions that you never see anywhere but on a beach boardwalk. We even saw a lady that appeared to be Prancercising. And then a super cold wind picked up and started whipping up sand, and it didn't let up. The people-watching was pretty fabulous, but it didn't quite trump getting pelted by sand in the cold. It was time to go. Despite leaving a tad earlier than planned, I was pretty darn happy with the trip results. I like the idea of taking a trip for the sake of running a race, but it's much more enjoyable - for the runner and the spectator - when you can get the race over with and then not worry about eating, drinking, and sleeping. Even better, running the race right off the bat means eating and drinking EVERYTHING for the rest of the trip and doing whatever floats your boat. Now that's a win.